Christmas in Eureka Springs, Arkansas is always fun but November 30 – December 8 it is magical! 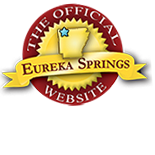 Visit Eureka Springs for the Annual EurekaSprings.com Christmas Festival. It is fun for the whole family and filled with special moments to make memories that will last a lifetime. •November 30 – The Annual Eureka Springs Chamber of Commerce Christmas Parade featuring Barry Williams (better known as Greg Brady of the Brady Bunch) as Grand Marshal. The parade features bands, lit floats and all the magic that the artists and makers imagine for the theme A Silver Screen Christmas. This year the sponsor is Arvest Bank. Parade winds down Spring Street in Downtown Eureka Springs and starts at 6PM. •November 30 – The ESDN Big Giveaway will happen during the Annual Christmas Parade. Enter to win over $500 in shopping vouchers and prizes given out in Basin Spring Park immediately following the parade. Volunteers will be on the parade route and in the park helping guests enter for their chance to win. Shopping vouchers are good at participating Eureka Springs and can be used just like cash. Win and shop in Eureka Springs. •December 1 – Santa in the Park from 2-4PM will delight families and is the perfect photo for your Christmas Cards. On hand will also be Mrs. Claus who will help children write letters to Santa. Those letters will be placed in the Big Red Mailbox sponsored by Tummy Tickler’s Kitchen Store and all letters will be answered by the Big Guy in Red. A S’more Station sponsored by Peace Love and Cheesecake will be on hand as well as a roving choir of carolers made up of Eureka Spring High School choir members. 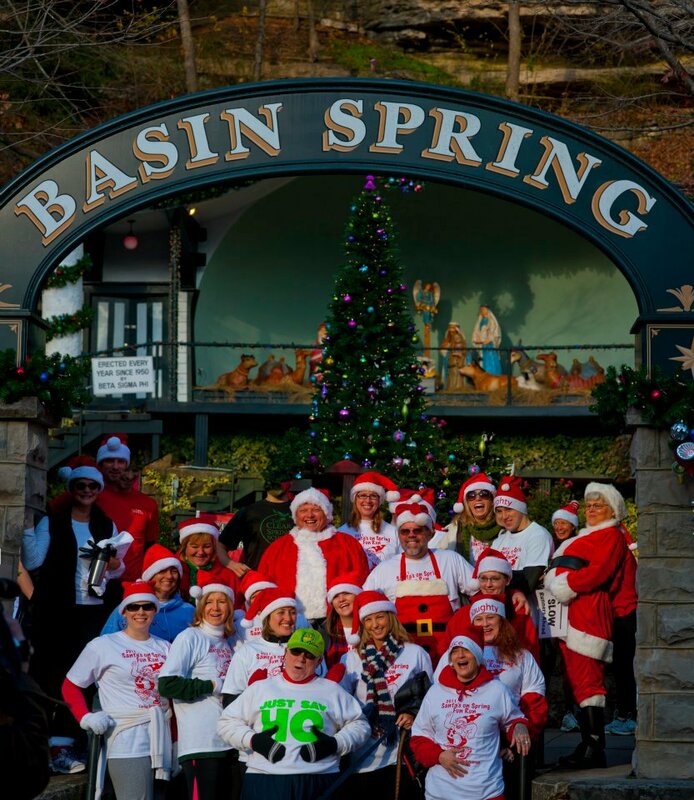 Families will also not want to miss the Eureka Springs Cheerleaders dressed as elves and hidden downtown with prizes. Search downtown for some Elven fun and win prizes along the way. •December 1 – The 30th Annual Christmas Tour of Homes presented by the Eureka Springs Preservation Society will feature homes downtown and the Penn Memorial Baptist Church, who is celebrating their 100th year. •December 1 – Living Windows will sparkle downtown from 4-6PM. Local stores put live models in the windows to the delight of shoppers as they stroll downtown and shop. •December 2 – 7 – Christmas at the Crescent will include Santa’s Brunch, Holiday Concerts, a Feast with Charles Dickens and Free Holiday Movies at the 1886 Crescent Hotel & Spa. •December 6 – The Annual Silver Tea presented by the St. James Episcopal Church and will benefit the Eureka Springs School of the Arts at the 1886 Crescent Hotel and Spa. •December 8 – Santa in the Park, Mrs. Claus, the S’more Station, and carolers. Photos with Santa are offered for a small donation to Eureka Springs Downtown Network. Prizes will also be given to those who find the Big Red Presents hidden downtown. 10 Boxes boast codes, bring those back to Basin Spring Park and be eligible to win gift certificates for area retailers. All activities are 2-4 PM. •December 8 – Living Windows will sparkle downtown from 4-6PM. •December 8 – Sip & Shop Downtown 4-6PM a Holiday Open House at participating retailers. They will serve snacks and sips to shoppers during the two hour party. Shop, sip and save as deals will be offered at each location. 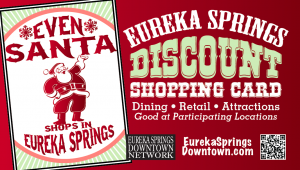 Also, Shop till you drop with your Eureka Springs Christmas Discount Card. Download the card and present it in participating venues to receive a special discount. The Card is accepted through January 31, 2012! 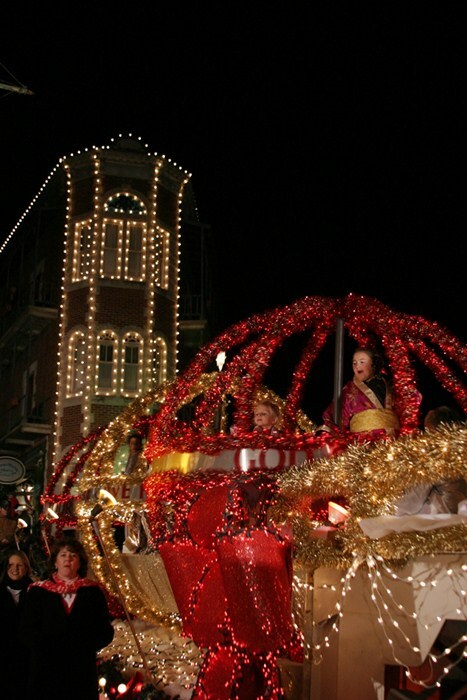 Check the Calendar of Events for more Christmas FUN in Eureka Springs. The 3rd Annual Christmas Festival is Sponsored by EurekaSprings.com. Find Eureka Springs lodging, dining and other great attractions and plan your trip! ***Free Parking! In addition to all of the available events, shoppers can take advantage of free parking December 1st – December 31st at meters for 2 hours of free parking. Full event information will be available at http://eurekaspringsdowntown.com. For more information contact the Eureka Springs Downtown Network at 479-244-5074 or director@eurekaspringsdowntown.com. This entry was posted on November 19, 2012 by estcblog in Attractions, Basin Park Hotel, Crescent Hotel, Festivals, Fun Downtown, Shopping, Things to Do and tagged Arkansas, christmas, downtown, Eureka Springs, historic downtown, Outdoor, Winter.